Introduction: Mary Harrell-Sesniak is a genealogist, author and editor with a strong technology background. In this guest blog post—just in time for Thanksgiving—Mary searches old newspapers to trace ancestry all the way back to the Pilgrims, who crossed the Atlantic Ocean on board the Mayflower in 1620 for a fresh start in the New World. 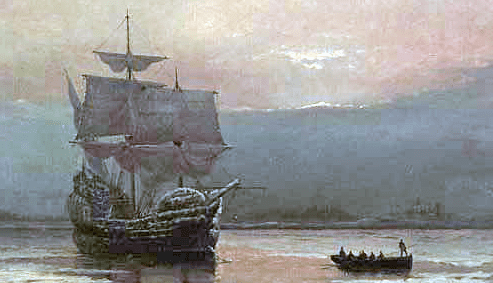 Although endlessly rewarding, it is true that tracing ancestry is a time-consuming process requiring much patience—especially if one wishes to connect to the Mayflower passengers, those 102 Pilgrims who sailed from Leiden, Holland, in September 1620 bound for the New World—anchoring off Cape Cod, Massachusetts, in November 1620. Painting: Mayflower in Plymouth Harbor, William Halsall, 1882. Credit: Pilgrim Hall Museum & Wikipedia. Tragically, only half the Plymouth Rock settlers survived their first winter in the New World—and if any are your progenitors, you could conceivably be required to compile from 12-18 generations of documentary evidence to trace your Pilgrim ancestry and prove you are a descendant. Fortunately, there are many ways to research the Mayflower voyage and the Pilgrims, even if you can’t visit Leiden or Plimoth Plantation in Plymouth, Massachusetts (although please put these stops on your genealogical travel shortlist). I traveled to Leiden, Holland, several years ago to conduct first-hand research on my Mayflower Pilgrim ancestry, and found this Dutch marriage record for future Mayflower ship passengers Isaac Allerton and Mary Norris from 1611. However, as I say, you don’t need to travel to research your Mayflower Pilgrim ancestry—you can do it from the comfort of your own home, relying on your computer and the Internet, using several helpful websites and having access to online historical newspapers. Common genealogical advice suggests that you start your family history research with yourself and work backwards to prove ancestry. However, with Mayflower genealogy research, you might want to work “down the research ladder,” instead of up, as it could very well save you a few steps. Start at the top of your family tree by looking for surnames matching the list of passengers on the Mayflower, shown on the accepted list of eligible ancestors compiled by Pilgrim lineage societies, most notably the General Society of Mayflower Descendants. And if that surname research strategy fails, research Mayflower descendants to the fifth generation to try and find a match to your family. Many publications exist, including the famous pink or gray Pilgrim lineage books published by the General Society of Mayflower Descendants—many of which are available at libraries. As accepted references, these Society publications allow you to bypass submitting proofs for any Mayflower descendant they’ve already established. The silver books trace the first five generations of Mayflower descendants. 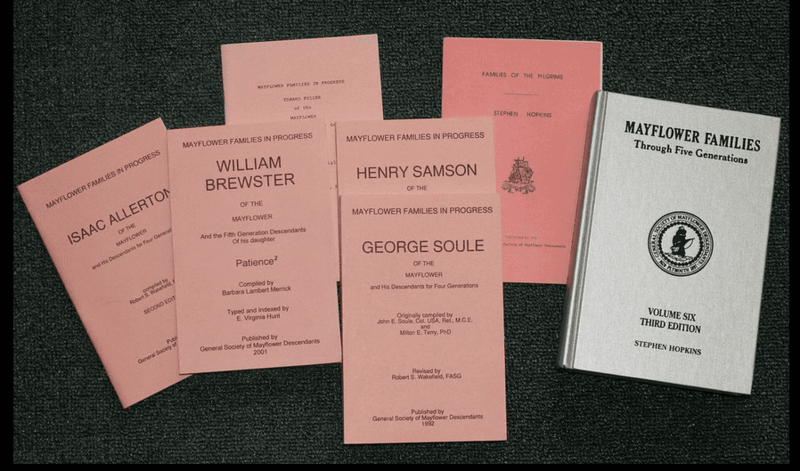 The smaller pink books are Mayflower Families in Progress (MFIP), and are produced as new information becomes available. 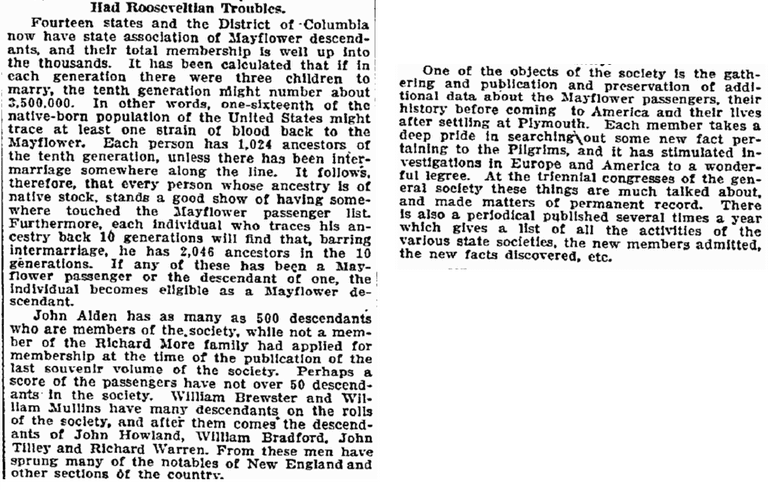 An extraordinary amount of newspaper articles and obituaries mentioning Mayflower ancestry exist in GenealogyBank’s historical newspaper archives. After William White died—as so many did, during the Colony’s first winter—Susanna married widower Edward Winslow, of whom much is written. After reaching manhood, Peregrine married Sarah Bassett, and if you are one of their descendants, you have a multitude of cousins. One of your relatives is their grandson George Young (1689-1771), son of their daughter Sarah White (1663-1755) and Thomas Young (1663-1732). George Young’s lineage was noted in this 1771 obituary. Being such a small colony of settlers, the Mayflower Pilgrim’s children intermarried. 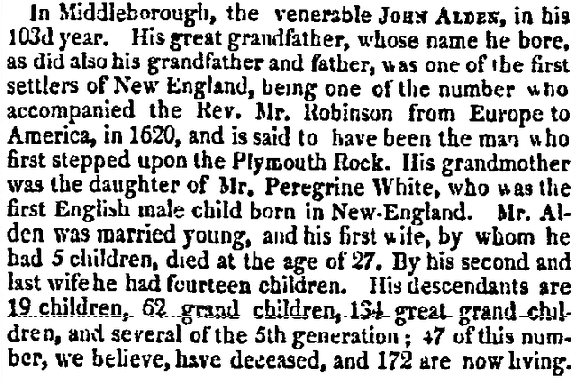 As reported in this 1821 newspaper article, John Alden was a descendant of his grandfather by the same name—and also of Peregrine White, via his grandmother. He is thought to have married twice, first to Lydia Lazell and later to Rebecca Weston, although neither of his wives are mentioned in this obituary. Note how many of John Alden’s descendants were living when he died at the ripe old age of 103. Elder James White, who founded the Seventh Day Adventist Church in Battle Creek, Michigan, was another direct descendant of the Mayflower Pilgrims. His religious affiliation and his Mayflower ancestry were reported in this 1881 newspaper obituary. Do you notice a trend in these obituaries? The importance of being a descendant of a Mayflower passenger tends to overshadow all other aspects of an individual’s life! 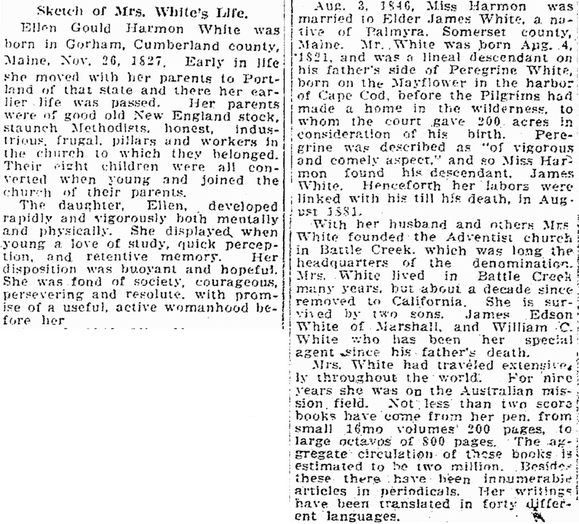 For example, Ellen Gould Harmon was the spouse of Elder James White—and her obituary from 1915 makes more notice of his roots than her own. Are You My Mayflower Cousin? 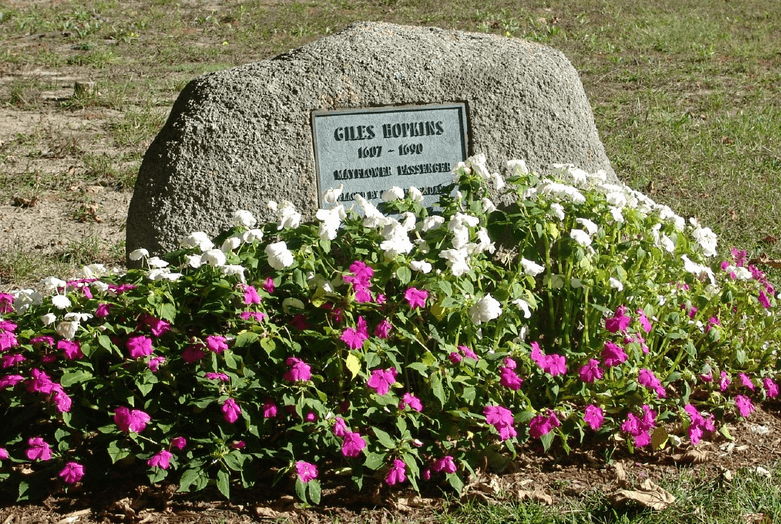 Photo: Grave of Giles Hopkins, Cove Burying Ground (Eastham, Massachusetts). Credit: Mary Harrell-Sesniak. We are in good company. By 1909, one writer’s conservative estimate calculated that by the 10th generation, any of the Mayflower passengers could have had at least 3,500,000 descendants! Since most Mayflower descendants are now of the 13th, 14th, 15th or 16th generation, that number has skyrocketed. The rising number of Mayflower Pilgrim descendants is reported in this 1909 newspaper article. If you think you are a descendant of the Mayflower passengers, this article from the New England Historic Genealogical Society may be of interest, “The Society of Mayflower Descendants: Who they are, where to find them, how to apply”. Learn more about the people on the Mayflower passenger list and how to research your Mayflower genealogy using GenealogyBank. Or search our ship passenger records to start tracing your family history on the Mayflower and other passenger ships from 1704-1984. Have you traced your ancestry back to one of the Mayflower ship passengers? If so, please tell us about it in the comments section. We’d love to know who your Mayflower ancestors are. Interesting article and according to your ancestry we are distant cousins. I have built on another relatives genealogy work and am descended from- William and Mary Brewster, Thomas Rogers thru son Joseph who was a child on the Mayflower and Stephen and Mary Hopkins thru Giles and Catherine Weldon. I find it amazing that out of 51 Pilgrims Millions of people can claim this ancestry. Nice to meet you and Happy Thanksgiving. I am related to Elizabeth & John Tilley, their dau. Desire, her son, James.Gorham, his dau. Experience Gorham Lothrop, her dau. Lydia Lothrop Bacon, her son, Ebenezer, his son, Ebenezer, his dau. Margaret Bacon Lewis whose son John Bacon Lewis continued the adventurous spirit & came to California in 1849. He stayed in San Francisco until 1857 when he & his wife moved to Petaluma, Sonoma, CA where the family resided until 2000 & separated to other parts of CA. I am a descendant of John Alden and Priscilla Mullins…. my Revolutionary War ancestor, Robert Lenthal Eells, married my Alden line ancestor Ruth Copeland. Sorry we are not cousins but I know many, many people who are Hopkins and Tilley descendants like you! Just attended the Maine Mayflower Society meeting last Saturday and it was great- we had an interpreter from Plimoth to speak with us in character, Elizabeth Tilley. I am so looking forward to the celebrations in 2020 for the 400th anniversary of the Pilgrims voyage!! Thank you for sharing all of the Mayflower connections! And for those who don’t share my Pilgrim ancestry, perhaps we are related in other ways. My best wishes for a Happy and Blessed Thanksgiving! I am a descendant of Isaac Allerton through his daughter Remember. 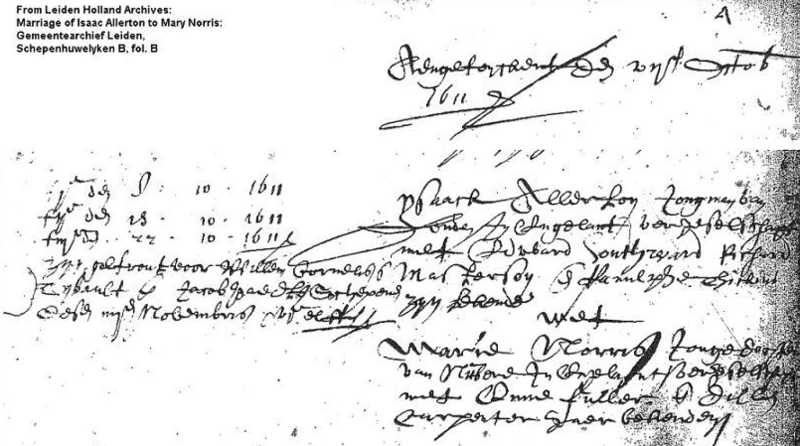 I have loved reading the Mayflower articles available on GenealogyBank.com and was thrilled to see the marriage record of Isaac and Mary Norris that you discovered in Leiden. Thank you so much for sharing that record and your knowledge on the blog! Very happy that the Isaac Allerton and Mary Norris marriage record was a welcome addition to your family research, and thank you also for the nice comments. One of the reasons I pursued this line, is that I have an ancestor named Isaac Allerton, but the proof connecting him to his ancestor is missing! Happy Thanksgiving, and enjoy your holidays. Thank you for your Thanksgiving greeting! Hope yours was as special as ours was, spent with family. So happy that you enjoyed this article. Are you referring to the Benjamin Spooner ca. 1714-1740, son of Rosamond Hammond and John Spooner (son of John S. Spooner)? I am descended from him, but info about him, perhaps because he died young, is a weak link in my Preliminary Review I’ve just filed with the Gen Soc. of Mayflower descendants. Congratulations on finding your connection to the Allertons. An easy way to save the image is to save the article in portable document format. Go to the bottom of the blog, and select PDF next to PRINT. After clicking on it, you will be presented with a SAVE, or a SAVE AS PDF option and can then proceed to save it to your computer. Although the name is long, I recommend adding a similar notation so the attribution is retained. I am descended from George Soule, Edward, Ann and Samuel Fuller. And probably Francis Eaton and William Brewster, and a few others but can’t prove those. Also Henry Howland, brother of John Howland of the Mayflower. anyway, I’m having lots of fun trying to make the “links” viable and real… sometimes there are wishful thinking people who claim some links that are just “wrong”. It certainly is fun tracking down the Mayflower connections. I recommend spending time with the pink and silver books, as well as contacting the various Mayflower groups to see if they can help you with your proofs. My husband is related to George Soule as well… so you are probably a cousin. Would you like to exchange information? The Soule line is through his mother..
Well, i have found that George Soule was the father-in-law of my 8th great uncle, Francis West. But so far, I haven’t found a Mayflower ancestor. Bonnie, at the time of your writing this, I had just discovered my connection to George Soule through Patience Soule (Soule, Haskell, Drinkwater, Bayes, Semple, and me). I’m a direct descendant and was completely shocked. I’m Canadian and didn’t realize there was a Canadian contingent of the Mayflower Society. I’m avidly on the trail. Spent August in the New England researching this interesting aspect of my family history. Hi Bob – I too am related to the Fullers! my ancestor is Joshua Robinson whose mother Ruth Fuller was the daughter of Sgt Samuel Fuller the son of Lt Samuel Fuller the son of Dr Matthew Fuller the son of Edward and Ann Fuller. I was curious about the first person in my family to step foot in America, thanks to the tv series “Who do you think you are” and “Finding your Roots”. With the help of online databases, I was shocked to discover my roots go waaaay back – both to Jamestown Colony (William Powell and Temperance Flowerdew) and the Mayflower (John Alden, Issac Allerton, William Brewster, Edward Fuller and Richard Warren). I wished I had paid more attention to American history in high school. And I am learning all about the English Civil war(s). Thank you so much for sharing, and best wishes for an enjoyable and memorable Thanksgiving. I think all genealogists relate to your comment about wishing we’d paid more attention in history class — but as you discovered, it’s never too late to start finding your family’s place in history. I am a decendent of Peregrin White, He was my 8th great grandfather on my fathers side, (George W Young 1901 to 2000), the direct decendent of Sarah White and Thomas Young. I am curious as to how much information exists about Sarah and Thomas and the decendents from them. My father was born in Arkansas and moved his family to the bay area of northern California in the mid 40’s, where I was born in 1946 he passed at age 99 in 2000. I currently live in northern Cal, just 120 miles north of our original home site. I had no clue as to who I was until after the deaths of my parents, my first introduction to Ancestry.com was exciting beyond my wildest dreams and then I went to Europe, on line, and found ancestors on my fathers side, of grandfathers Young, Yonge etc. back to the year 1325 My mom was also the decendent of very early pilgrims sur names Savage/Glotfellty who settled in the north west parts of Pennsylvania and southern Maryland, the Savage side of which may have been here even before the Mayflower, as they came from the Virginia area. Wow, Who knew? Very exciting stuff! What an exciting genealogical journey. Peregrine White is widely followed. You may wish to research him in the many books published on the Mayflower passengers. Hello Sandy, I believe we are related through Peregrine White. I found out after my Grandfathers death through a published book by Roscoe White called White Family Records; Descendants of Peregrine White, son of William and Susanna (Fuller) White, 1620 to 1939. My grandfather, James Russell Jenkins and my Great grandmother, Marella Bernice (Bush) Jenkins were listed. If I am reading it correctly, then I am a 12th lineal descendant. I am utterly amazed and shocked. I have recently submitted my descendant list to The Mayflower Society. I am eagerly awaiting their findings. Hello, I too am a descendent of Peregrine White. He is my 9th great grandfather on my fathers side. My father was a direct decedent of Daniel Peregrine White, Sarah’s brother. Your information is a great help. I started my family tree and could go no further back than Ellis Island. So I started to work on my husbands. His grandmother was Florence Alvord and if I am accurate, through Ruth Norcott, there is relation to multiple Mayflower passengers. I was more excited I think than he was! Remembering grade school and our study of the Mayflower and Pilgrims. Imagine being a descendant! You would have been a celebrity! Anyway, I am afraid to tell the rest of the family until I am sure. Some of the information and references you provided will make me feel more confident with my findings. Wonderful to hear that my article helped with your husband’s research, and I sincerely hope you’ll be able to discover more of your own. Glad you enjoyed my Mayflower blog. Good luck with finding the birth record of Sylvanus Whiting. I wasn’t able to find anything in the newspapers, but recommend you visit the National Archives to see if they have any clues. In researching my husbands family I found out the line goes back to William Holmes who came here from England in 1632. His oldest son was John who was born 1638 in Plymouth Colony. John’s oldest son was Joseph who married Mary Brewster. My father-in-law gave us a book titled “The Giles Memorial” and in it was preserved “The Holmes of Marshfield”. I have been researching my parents ancestry as well as the Holmes and have enjoyed and been amazed at the discoveries. It’s been wonderful. So nice to hear about your research. It’s thrilling to make these Mayflower connections. HI Elaine So Are Joseph’s Descendants Mayflower Descendants?? How is his wife Mary Brewster connected to William and Mary Brewster??? Hello, cousin! I am a descendent of Stephen Hopkins and his daughter Constance. My line runs through Shelburne County, Nova Scotia. Unfortunately, I cannot find proof for one ancestor. I can find proof he existed but not of his parentage. He’s the son of Nathan Snow and his wife Mary aka Polly. It’s been a decade. I am related to two of his offspring and can prove to his parents and the generations after him. Maddening! Very exciting to hear about your Hopkins connection, but sorry to hear that the proof of parentage can not be established. I have a similar issue with one of my lines. Hope you find the proof you are looking for. Hi. I also am descended from Stephen Hopkins and Nathan Snow. I descend from William/Mary Brewster and Stephen Hopkins of the Mayflower 1620. Congratulations on this exciting ancestry! I am related to George Soule ,his daughter married a Weston who came on a later ship. My great grandmother was a Weston. I want to share this information with my near relatives at Thanksgiving. I’d also like to try and join the Mayflower society, I live in Washington state. Thank you for sharing this information. Glad that you enjoyed the article. I guess we also are distant cousins, as I am a descendent of Giles Hopkins on my father’s side and Edward Fuller on my mother’s side. As you point out, there would necessarily have been a fair amount of intermarriage among the surviving Mayflower families, so I am trying to figure out how to track down from other Mayflower families to my own. I would really like to see a connection with the Howland family as a good friend of mine is a descendent of that family. I am sure in this age of computerized databases I ought to be able to input my name, or some of my ancesestor’s names into a Howland family database to see if there is a connection. Do I have to join a society to do such? If so, do have you a recommendation as which would have better search facilities for finding connections between generations? Thank you for sharing your interest in Mayflower research. You do not have to join a society, although many enjoy meeting with their distant cousins and learning more about their roots. Others do the research on their own or join social media groups. Thanks for your research and blog. I believe I am a descendent of Edward Doty. I am having problems connecting several generations back to him. Is there a site or source where I can obtain a chart or description of his line of descendants? Congratulations on your research regarding a probable descent from Edward Doty. There are many websites and social media pages regarding Mayflower research, but the most definitive source would be to make contact with the General Society of Mayflower Descendants. You’ll find information on their website as to how to proceed. I too am a descendent of Edward Doty. My first cousin has jusy been authenticated as a descendent to him . My apologies for missing your post. Thanks for your information. I did a search in GenealogyBank for records, but was not able to location anything to help. Hope you have been able to solve your Crowell/Dickey connection. I’ve been doing my ancestor research for a few years now and came across a Sarah Hannah White born in 1641 in Durham, Strafford, New Hampshire to a John White and Lucy ??. John White was born about 1604 in Bradford Abbas, Dorset, England and died November 1678 in Kittery, York, Maine. His parents are Thomas White and Ann White(Looman). Sarah’s siblings are Mary White(Thompson) and Hannah White(Allen) that I have found so far. Is there anyway I could find out if his line is connected with Peregrine White? Congratulations on your research. To connect an early ancestor to a Mayflower passenger, start by researching in the “Mayflower Families Through Five Generations” books. Many are available at local libraries or through interlibrary loan programs. Alternatively, you may wish to purchase one or hire a Mayflower genealogist to complete your research. Descended from John Howland and Elizabeth Tilley………..also from James Chilton and wife through daugher Isabella who came over from the Netherlands later. Thanks for sharing your connection s to the Mayflower. Thanks for your info. I am a Dunham. I have at least four possible Mayflower ancestors, Francis Cooke, John Howland, Elizabeth Tilley and Stephen Hopkins. I have wanted to verify and confirm this ancestry. Your tips are valuable to me because I always thought it would be smarter to start from the top. Nice to know you enjoyed the article. Hope you make the connection to your possible Mayflower ancestors. I too am a Dunham! I’m even a Susan (Sue) Dunham! Eventually, in 1833, one of my Dunhams married Mary Jane Beard, who has an almost entirely maternal line going all the way back to the Allertons on the Mayflower. It’s so funny that my Dunham ancestors didn’t connect to the Mayflower until 1833! I suspect I just don’t know yet about the other earlier connections between Dunhams and Mayflower descendants. Oh my goodness I love being related to folks on the Mayflower! John Cooke, Francis Cooke, Stephen Hopkins, Giles Hopkins, William Bradford, Whilliam White and Resolved White are all my Grandpas!!! Thanks for more information on researching Cousin❤. You’re so very welcome. Glad you enjoyed my Mayflower article. How exciting that your family arrived on the Anne in 1623. Since this was after the arrival of the Mayflower, I recommend you pursue your Hopkins ancestry. Another strategy is to see if any of the Wallen descendants match other names in the various Mayflower book. The likelihood of a connection is high. If you are interested in professional research services, please reply again and someone will contact you. My mother always told me that we were descendants of William Bradford. I know my great grandfather “Henry Terrette” was married to Flora Bradford. That’s as far as I have gotten. Hopefully you will be able to help me out. Thanks for writing. I think there is a good chance you’re a descendant. To do the research yourself, start by tracing your great grandmother’s lineage through the Bradfords. After a few generations, compare the lineage to names identified in the various Mayflower books. If you prefer to have a professional search conducted, please reply again and I’ll contact you with details about my services. Bradford cane? I am a decendent and would like to know about this. It sounds like a nice tradition. Obviousely it would require multiple canes as there are different branches of that tree. My mother was Priscilla Hafford. Her father was Fred Hafford and her mother was Jeannette(June) …..Olive Nadeau was her mother. I believe the connection comes on the Hafford side and can be traced down to Todd Hafford( Fred Hafford’s father). This is all brand new to me. It was brought to my attention by my Grand Daughter. She found out through a school project and a teacher who has done much research. My maiden name was Thibodeau. I would appreciate information re the cane. Thank you. Below is my lineage …. If anyone is related to me, feel free to say hello. I have been researching my tree for quite some time now and I get very close to the Mayflower and then I hit a dead end. I read your lineage with interest – particularly the Gould line. I found a Jane/Sarah Gould 1604-1680. She married John Williams 1600-1674. Would she be somewhere in your line, too? There is so much mis-information on the web and it can be quite frustrating at times. Congratulations on your lineage! Something to proud of for sure!! Thank you for the nice comments. The Goulds are unfortunately not in my direct line. You are correct — there is much misinformation on the Web. Hope you are the one who proves the connection so that others finally get it right! Let me start by saying “hello” as you suggested. We are distantly related through the Brewsters and Hopkins. What exciting lineages that we share with many others. Sounds like an interesting lineage. The research can be confusing, especially with so many generations to trace. You might find it useful to use genealogy software. I know I couldn’t keep track of everything without a program. My lineage if my family is of the same Bassett line as Sarah Bassett is to her and Perigrine white.I can go back as far as Nicholas Bassett my great grandfather and no further . The rumor in the family is we are decendants of (as I call it,The mayflower crowd) and the Bassetts are from England. How do I find out more? It would be very interesting to find out one way or the other, because I know there are lots of Bassets and there probably is no connection, but I would like to know. Dear Martha, My research shows that the Bassetts were from Dorking, England. Ann Holland Bassett Burt, remarried widow of Roger Bassett, along with her son, William, on board the Abigail in 1635, landed at Lynn, Massachusetts I can trace my lineage back to Isaac Allerton and Mary Norris via other ancestors.. I will definitely look for a Mayflower connection via the Bassets. I believe that I may be a decendent of both Stephen Hopkins and John Alden through the the Rickard family with connections to the Nurse family.Mary Elizabeth Rickard married Silas Nurse. Thanks for sharing your connection to the Mayflower passengers. I am also descended from Stephen Hopkins, but through different descendants. I just discovered your wonderful blog, thank you! I believe I may be a direct descendant of William White through his “less illustrious” son, Resolved. I’ll be visiting the Pilgrim House museum in Leiden this week and hope to glean more information on all the Pilgrims. Looking forward to the trip. Thank you for writing. Hope you enjoy your visit to Leiden and the delightful Pilgrim Museum! If you find anything unique about your ancestors, please share it with me. You and I may be related as well. I have traced my tree back to Resolved as well, and I don’t think he was any “less illustrious” than his brother, considering that as a 5 year old he survived that trip and the first winter! Resolved married Judith Vassal and their daughter, Elizabeth married my 8th Great Grandfather, Obadiah Wheeler. I have done extensive research, and there is also a published book “The Encyclopedic and Genealogical history of the Wheeler Family in America” and it traces from Obadiah and Elizabeth (White) Wheeler all the way down to my great grandfather’s generation, listing all his brothers and sisters. That made if fairly easy for me to connect the dots, as they say. It would be great to hear how we might be related! I believe that I am descended from John Howland and his wife Elizabeth Tilley through descendants of their son John Howland and his wife Mary Lee. I have most of the information that I need to make the connections, but I am missing the birth information for William Pierce (possibly also spelled Peirce) who married their great-great-great grand daughter Lois Thomas. He was born in Taunton, MA around 1764-1766 and he and Lois were married there in 1786. They later moved to Ohio and both died there. I have information on their marriage, their children, and their deaths and places of burial, but cannot find any information on his birth. I would appreciate any suggestions you can provide. Thanks! Research the churches where the parents and couple married, and also the one the family transferred to in Ohio. You may have to go in person or hire a professional researcher. Politely ask if you can gain access to original church records. Remember not every record has been photographed, documented or transcribed correctly. Volunteers are prone to picking and choosing what they find most important, skipping what doesn’t apply to them. I find volunteering to help a church or a donation may help. Then contact (by phone) the various family cemeteries along with the historical society in Ohio and the other locations. There may be a family record or copy of a bible record in their files. Ask to speak to the Sexton to see if there are records not known about by the person answering the phone. If there is an existing tombstone, try to decipher it. Look to see when it was added, along with who purchased it. Leave brief messages on the Findagrave or Billion Graves memorials so a descendant with the missing proof can contact you. This may seem like a long shot, but this has been successful for many. There are many one of a kind records in files the public does not have access to. Sometimes we are contacted years later by distant cousins willing to share documentation. Thank you for the suggestions. I think they will be very helpful as I try to find the information that I need. Apparently this particular line (through Lois Thomas and William Pierce) to John Howland hasn’t been used before. Nothing like breaking new ground. 🙂 Again, thanks for your help. Pat- The information that Mary gave is exactly what I would have suggested. Great advice! The only thing I would add is information that can be found in newspapers can be helpful in researching that far back. We are distant cousins as well. My ancestry traces back to Elizabeth Hopkins, daughter of Steven Hopkins and Mary Merrick; Stephen Hopkins, son of Giles Hopkins and Catorne Wheldon; Giles Hopkins, son of Stephen Hopkins and his first wife. Thanks for the comment. Very nice to network with another Mayflower cousin. I have just sent in my application and documentation to the Mayflower Society in Maine. I come from John Howland and Elizabeth Tilley, as well as her parents of course. My line is through their daughter Hope, and her daughter Ruth Chipman. who married Eleazer Crocker, their son Abel, his son Daniel and his son Daniel Jr., his daughter Hannah Crocker who married Andrew Gavel–their daughter Emeline (Emily) who married John Smith Van Beuren Harding. He was my maternal great-great grandfather. I did the Ancestry DNA, and today had a positive DNA to Andrew Gavel. Nice to have more confirmation. This is very exiting to me as I only began this journey last year, and was thrilled to find 3 Harding brothers who came over to Massachusetts in 1623. I have been trying to find what ship–it may be the ‘Anne” but have not found confirmation. Thank you for the site. Emeline (Emily) Gavel was the sister of my great grand father, John Smith Harding Gavel. Supposedly child of Andrew Gavel and Hannah Crocker. Strange to call him after the man who married Emily. Emily would have been about 18 when her brother was born. I don’t know when Emily married Harding. Thank you for sharing your lineage and the confirmation from your DNA test. Very impressive that you were able to gather the necessary documents and evidence in such a short time. Hope you learn the ship your ancestors were on when they came to America. I did the process and joined the SoMD about three years ago. I’ve confirmed descent from Isaac and Mary Allerton and their daughter Remember. I’m also a direct descendant of Deacon John Dunham and Abigail Balliou , although they stayed behind in Leiden and arrived two or so years later to Plymouth after the Mayflower. I went to Leiden this past January and visit the pilgrim museum there – fabulous experience! I would love to connect with you and explore any intermarriage(s) that I haven’t stumbled upon yet. I’ve had my DNA and my father’s tested. Nice that you were able to visit Leidena and the Pilgrim Museum, as well as to join the Society. To add to the family research, I can recommend expanding your newspaper research. There are still many discoveries still left to be found in GenealogyBank — and when you find them, be sure to share with others. An aunt or cousin of mine researched my mother’s maiden name “McAuslan” and it traced to John Howland. How can I get an updated version of this list? Thomas- I am assuming you are wanting an updated version of the Mayflower list. You can google list that may be helpful to your family. There are many websites you can search as well as searching newspaper article about the descendants. Another good site for the Mayflower heritage is http://mayflowerhistory.com/mayflower-genealogy/. Hello. Just wanted to tell you that I am a direct descendant of Richard More on my father’s side. Of the four More children who arrived with the 3 families they were boarded with, he was the only one to survive that first winter. From everything I’ve read about him he had quite an “adventurous” life to say the least! I’ve visited his grave site in Salem, Ma. (where my husband is from) and thought it would’ve been great to talk to him, and get his story. Thanks for getting in touch. It does sound like he was an adventurous man. Hello, I was wondering if someone could answer this question. Through research I have found that I may be related to Samuel Fuller, the son of Edward Fuller. Wouldn’t Edward Fuller be the one you would apply for if applying for the Society? Also, in my tentative research I have found links to Isaac Allerton. Do you have to apply for each person you are descended from? was a Warren; She married Frank Pike from Vermont, moving to Massachusetts. Like genealogists say, ‘everyone is 50th cousin or less……………’ Almost scary, eh? Thank you for writing. I would agree with Karen Reich’s reply. After joining, you can make additional applications for supplemental ancestors. Are you descended from the Fuller’s? I am a descendent of Matthew Fuller who was Samuels brother – the sons of Edward and Ann Fuller. Excited to just find out that Thomas Rogers was my 9th Great Grandfather on my mother’s side. What a pleasure to be a descendant from the Mayflower. Thank you for writing and sharing your excitement to learn about your 9th great grandfather. Do I need to find a library that has these gray or pink books that you mentioned? Any suggestions on how I go about proving the line would be appreciated. If the Society only confirmed the first five generations of your family lineage, you do not need to locate the books, unless you wish to cite them for personal reasons. I suggest contacting a local chapter and discussing your ancestry with the registrar. You will be guided as to what evidence you need to accumulate. In general, you will need documents connecting one generation to the next, including pertinent births, marriages and deaths in your direct line. We are cousins. My name is Jan Corley and I live in Peterborough, Ontario, Canada. Giles Hopkins & Catherine Wheldon are my 10th GG making Stephen Hopkins and his first wife my 11th GG. If you would like to communicate, please do. Thank you for writing. It’s always nice to hear from a cousin in the Mayflower line. My children’s 11th grandfather (on their dad’s side) was Giles Hopkins as well. Hi cousin! Hello. I guess we must be cousins. My name is Ron Collins and I am a direct descendant of William, Mary and Love Brewster. I have lived in Plymouth, Massachusetts, for 34 years now and just found this out about 18 months ago. I am also a direct descendant of Gov. William Bradford. I have walked by his statue many times and never knew he was my great grandfather X9. So cool to live were they also lived. Thanks for writing. How fun that you live in Plymouth and only just discovered your connection to the Brewsters and Bradfords! Hello. I am researching my own lineage, and my whole life I believed that all my relatives were straight from Germany, Massachusetts and New York. Then, the other day, I see in a handwritten story that a man named George Crowell may have come over on the Mayflower in 1620 and he is from London. So on a whim, I’m searching passenger lists. I can’t link him to the list you have but I am wondering if the Mayflower made other voyages?? have done extensive research on the people of Plymouth Colony. Descendant of Priscilla Mullins through my mother’s line, and from John Alden by marriage. As Susan pointed out, there was more than one ship named Mayflower. All early immigrant research is exciting, even if you don’t connect to the first Mayflower voyage. You have several exciting connections to the Mayflower. It’s not often I come across someone with one of the surnames, so thank you also for sharing your connection by marriage. I am also connected to the Olmsteds of Hartford, so we are distantly related. Hello. I researched my husband’s family. Leslie Chipman descendant from John Howland and Elizabeth Tilley daughter Hope Howland Chipman (John Chipman ). Was so excited for the Chipman family. Thank you for your comment. You have interesting roots. How nice that you are a direct descendant of the Chipman line. I am descended from Margaret Howland, mother of John Howland. Just getting into my ancestry, although my father and my uncle did a lot of work. John Howland was apparently the illegitimate son of an incestuous relationship between Margaret Howland and her brother Henry Howland. The family arranged to have him shipped on the Mayflower as an indentured servant to hide the scandal. Margaret’s father arranged to have her married to Richard Bissell, who was probably in the military. Their son John Bissell, John Howland’s half brother, is my direct ancestor. My mother said we were descended from William White, but I haven’t been able to confirm this. Thank you for sharing your connection to the Mayflower. Billington connection here I believe? Thank you for writing. Hope you make the connection to the Billingtons. Thanks for writing and sharing your connection to the Brewsters. I am 14 generations to Resolved White 1614-1687, and also 13 generations to George Soule 1593-1679 because of his great-great granddaughter Sarah Waste 1748-1789. That’s exciting to have two connections to the Mayflower. Thank you for sharing. Are any descendants of James Avery or William Dennison also Mayflower descendents? Assuming you are talking about early immigrants, I am certain there are descendants that have Mayflower ancestry (such as myself to the Dennison line) and many who don’t. Each line needs to be looked at individually to know for certain. I have traced my lineage back to Resolved White, brother of Peregrine, son of William & Susanna. I am currently living in Arizona, but my husband and I travel to New England in the summer to escape the heat of the desert. Since it was only recently I tied all this together (within the last 18 months) I am spending some of my days visiting the Massachusetts and New Hampshire archives and vital records to get the necessary birth certificates for membership in the Mayflower Society. I recently came across some new evidence regarding Susanna’s actual identity. I received the book; however, it is at my sister’s house in MA and I just haven’t made it over to see her since she received it for me. My only regret is that I wasn’t that interested in genealogy until after my grandparents and parents passed on. I am sure they had a wealth of personal knowledge that would have made this journey easier. This may be a silly question but I see people writing that so and so is my 9th great grandpa or whatnot, how exactly do you figure that out? Do I start counting from my grandpa? Sorry, silly… Direct descendant of John Alden and William Bradford here… Dad had genealogy done. Cindy, the Ancestry website is a great help. My former husband is a direct descendant of John Howland and Elizabeth Tilly. I just looked at other trees that listed his parents and grand parents and worked backward to John Howland and Elizabeth Tilley. My Grandson traced my Grandmother Porters’ background all the way back to Richard Warren, a passenger on the Mayflower! Richard Warren married Elizabeth J. Jouatt (Ivatt).Their daughter Anna Warren married Thomas Little, their daughter Abigail Little married Josiah Keen, and our family was traced down from there! Mary Chilton is my 9th great grandmother; was so glad when I found her in my tree. Thank you for commenting. It’s always exciting to make a Mayflower connection. Thank you for sharing your connection to Peregrine White. Hi Mary. My name is Wayne Clifton, but I’m writing in regards to my wife, Nancy Radaker. We recently found a document page from her parents that seems to indicate that Peter Brown (Browne?) is in her heritage, but we’re not sure where to go from here. Since you seem to be very current on Mayflower information, we were wondering if you might be interested in reading the one-page document. I can send it along if you’re interested; just let me know. We were told we are descendants of William Bradford. My son did a project for school and went back to Bradford who is his 16th grandfather. What do we have to do to prove our lineage? Thank you. Through my paternal grandmother, I am descended from Stephen Hopkins through his daughter Constance Hopkins and her husband Nicholas Snow. Through my maternal grandmother, I am descended from William Brewster and Mary through their son Jonathan and his wife Lucretia. Other notable ancestors in colonial history are Governor William Stone of Maryland and his wife Verlinda Graves, whose father was Thomas Graves of Jamestown. Another notable direct ancestor is John Lathrop. The infamous Benedict Arnold was a nephew of my direct ancestor Eleazer Waterman. Enjoyed browsing and wishing… Thompson is the only name I see that I have proven to the late 1600s. This states that Thompson died first. Is there any other information on this Thompson? I have several ancestors proven to the late 1600s but Thompson is the only name recognizable on the list of Pilgrims. I have Quirl, Slaughter, Miller, Forehand, Grimes, Thompson, Luck, Munich, Castleman, Crownover, Stanley, Smith, to name a few. We’re not equipped to do personal research through the Genealogybank Blog, so I recommend you network with active Thompson researchers. Look for research groups on Social Media sites, such as Facebook. I believe there may be a forum devoted to the Thompson surname. Hello. I am descended from Rogers, Howland, Tilley, and Winslow. Just starting on this adventure!! Thank you for sharing your connection. Hope you enjoy the adventure! I believe I found lineage from Peregrine White. It goes: Sylvanus White, William White, Oliver White, Mary White Collins, Joshua Collins, Margaret Collins Blaisedell, Mary Blaisedell Seabridge, Lee Seabridge, Grace Seabridge Hibbs, my Grandmother. I also saw a few Warrens back there, but have not looked at them too closely. Very interesting article. Thank you. Glad you enjoyed the article. You have an exciting connection to the Mayflower. I have recently discovered that I have Mayflower ancestors! So exciting! They are: the Billingtons – 10th and 11th great-grandparents; Francis Cooke – 12th great-grandfather and his son John my 11th great-grandfather and Richard Warren. Thank you for writing and sharing your exciting Mayflower discoveries. Having only just read this message thread I’m looking forward to reading your article. Having dabbled in genealogy for the past couple of decades I never went much beyond 1700 until a DAR member connected me with Soule paternally, a near miss to Henry Howland, brother of John. A cousin recently gave me a copy of a bare genealogy linking her to Roger Allerton Tilley and Howland. Doty and a couple others have shown up in my own research. Just today a maternal link to Hopkins showed up. This is definitely an obsession I’m not sorry for! Thank you for sharing your enthusiasm for this genealogy research! This is a great site to read and follow. Thank you for your kind words, Paul. I believe I am a relative of Myles Standish. That is an exciting discovery. Hope you confirm the connection. I’m a direct decendant of Peregrine White. I’m 15th or 16th generation. My mom has applied for a certificate of pilgrammage. Thank you for sharing this just before Thanksgiving! My husband is also a direct descendant of Peregrine White. He’s the 16th generation and our children are the 17th! Dianne Manchester. Hi – we just found out we are descendants of the Fullers. Edward and his wife Ann were on the Mayflower and died that first winter – their son Samuel (and his uncle Samuel) lived. Their other son Matthew Fuller didn’t come on the Mayflower but came twenty years later and was involved in colonial life. I am directly descendent of his. We also are related to John Robinson who was the Pastor to the Pilgrims and a founder of the Congregational church. I am amazed! Anyone else a descendent of the Fullers? i have three relative that where on the Mayflower Stephen Fuller,Stephen Hopkins, Giles Hopkins, and John Tilley and Joan Hurst are all my descendants. Edward and Anne Fuller were my 9th g grandparents. Thank you for sharing your connection. What a nice discovery and great timing just before Thanksgiving. Hon. Isaac Allerton – connected from Ichabod’s marriage. Nice to learn of your connection to the Mayflower passengers. So nice to hear of your connection to 11 Mayflower Colonist/Pilgrims. Thank you for sharing this information. I think I might be a descendant of John Cooke. I need more information on his daughter Elizabeth and her husband, Daniel Wilcox. I have found conflicting informaton on who she was married to and when. One of the best things to do when considering conflicting information is to determine the accuracy/reliability of the source(s). Is it primary/secondary? Have you seen actual documents that help to prove/disprove the claims being made? Elizabeth’s profile in Geni may be seen here (https://www.geni.com/people/Elizabeth-Wilcox/6000000003938270499). “The Five Generations Project of the General Society of Mayflower Descendants in 1996 published its account of the descendants of Francis Cooke as Volume Twelve in the series, compiled by Ralph Van Wood Jr.” (Quoted from https://mayflower.americanancestors.org/francis-cook-biography . Visited Jan. 22, 2019.) This might be a book to look into for resources on whom Elizabeth married and when. John & Susan Howell Family Trees (https://www.jhowell.com/tng/getperson.php?personID=I3501) website has Elizabeth tied to Daniel Wilcox. Message boards can be another great tool for you to help you discover information regarding Elizabeth’s husband(s). Here’s one on Francis Cooke (Elizabeth’s grandfather) that may assist you (https://www.ancestry.com/boards/surnames.cook/6314/mb.ashx). I wish you much success in your efforts! Happy hunting! Thank you helping Michael with his research. I have numerous ancestors that were passengers on the Mayflower, namely: William Brewster (9th great-grandfather), Mary Brewster (9th great-grandmother), Love Brewster (9th great-uncle), Francis Eaton (8th great-grandfather), Sarah Eaton (8th great-grandmother), Samuel Eaton (8th great-uncle). These are from the confirmed list. I also have John Turner (9th great-grandfather) and those who came with him. Thomas Rogers, a (2C10R), and others in great aunts and uncles or spouses. My line is closer than most due to the fact that my father was a 20th child from a Civil War Veteran from his third wife. I have my DNA confirmed with ancestry.com. I cannot establish a documented line to the Mayflower ancestors as no records exist for some marriages, like my great-grandparents on my father’s paternal line that traces back. I have matching DNA with many in these lines. Nice to hear about your lineages. Interesting how your father was the 20th child of a Civil War veteran! I wouldn’t give up on your research. You may some day find an elusive church record or a cousin with the evidence you need. It was exciting to uncover this information and history of my Paternal grandmother, Elizabeth Dunning Ford’s family. Thank you for sharing this information. The first year was very difficult for the Mayflower passengers. Sorry that Thomas Rogers didn’t survive longer. Stephen Hopkins is my relative. Anyone have any more information? anyone finding Hannah Paine 1770 -1805 marrying Otis Smith 1771 – 1833, please let us know.